Cemintel Territory is a modern, innovative and distinctive walling system ideal for any façade application, and unique to the Australian market. The system consists of a range of pre-finished cement-bonded, fibrous wood particle panels, that simulate materials like stone, timber, concrete, metal, tiles and smooth render. Territory offers unique textures and finishes that can be used as standalone or composite solutions to produce a contemporary and individual look to the interior and exterior of your home. Cemintel Territory is ideal for a variety applications ranging from feature areas to full story wraps. All panels in the Cemintel Territory range are installed using the same quick and easy installation method, by simply attaching them directly to a steel or timber building frame, using a unique clip fix. This fixing method provides a ventilated cavity to keep your building dry. Cemintel Territory can be installed by carpenters, using existing fibre cement tools. Designed as a result of feedback from the market for a pre-finished façade that offers an authentic, but modern appearance, Cemintel BareStone™ combines the look of raw cement with the ease of installation and performance of the Cemintel ExpressWall™ system. The combination is proving to be a real success and has been widely used in both residential and commercial applications. The system consists of 9mm compressed panels that are coated in Cemintel™’s unique CeminSeal™ technology, making them impervious to water. Not only does this create a great looking, modern appearance, the application of CeminSeal™ also eliminates the requirement to paint on site, reducing installation time. Barestone™ utilises Cemintel’s ExpressWall™ fixing system, ensuring it is both an easy to install and highly durable solution. Vertical top hats have two fixing points for stability and create a structurally sound facade that has been designed and tested to be resistant to wind pressure in cyclonic regions. Highly durable, self-adhesive gaskets are easily attached to the top hat prior to installation, reducing installation time. The gasket seals vertical and horizontal joints, reducing the requirement for sealant and accommodating building movement. Combining a modern, express jointed aesthetic with a fast and economical top hat installation system, Cemintel ExpressWall™ is an ideal façade solution for commercial and industrial applications. Cemintel ExpressPanel’s™ provide architects and designers a high level of creative freedom. They can be arranged in a variety of patterns and are pre-sealed to accept a wide range of decorative finishes. Cemintel ExpressWall™ utilises a top hat fixing system, ensuring both an easy to install and highly durable solution. Vertical top hats have two fixing points for stability and create a structurally sound facade that can even withstand cyclonic conditions. Highly durable, self-adhesive gaskets are easily attached to the top hat prior to installation, reducing installation time. The gasket seals vertical and horizontal joints, reducing the requirement for sealant and accommodating building movement. The panels are manufactured from 9mm compressed fibre cement, providing a highly durable and long lasting solution. Cemintel Mosaic™ cladding provides a versatile and durable façade with modern geometric styling for residential buildings. Cemintel Mosaic™ is a highly adaptable system which can be used over steel or timber stud framing. Cemintel Mosaic™ Panel is an 8mm thick, fibre cement cladding which is purpose manufactured for use on residential building façades. The panels are supported by advanced lightweight fibre cement battens. The panels may be arranged in a variety of patterns, and surface relief is produced by expressed joint finishing. Cemintel Mosaic™ is a square edge panel with a smooth flat surface that can be finished with a wide variety of exterior grade acrylic paint or aggregate finishes, resulting in a high degree of design freedom. Easy to install, Cemintel Mosaic™ cladding can be fixed with machine driven nails, and comes with pre-primed face and primed black edges, reducing required finishing time and helping to create a durable, attractive and professional finish. Cemintel Edge™ cladding panels are fibre cement panels featuring a modern sharp-edge vertical expressed groove design. These panels incorporate mating vertical edges and are suitable for gun-nailing for fast and efficient installation. 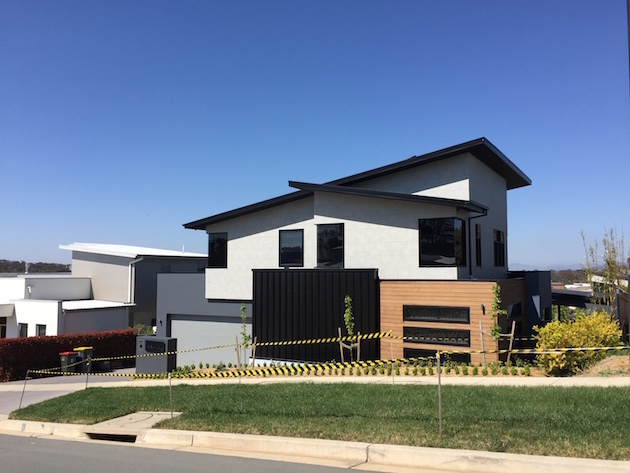 Edge™ panels feature vertical grooves at 150mm centres to accentuate a regular linear design and provide a modern alternative to the traditional weatherboard patterns. Cemintel Edge™ cladding is manufactured from an advanced lightweight fibre cement. Cemintel Aspect provides a versatile and durable façade with a modern style for timber or steel frame residential buildings. Cemintel Aspect is a 300mm wide, 12mm thick board with a machine profiled shiplapped joint. It has a recessed overlap providing a 16mm horizontal joint feature providing a similar aesthetic to a decorative render. Cemintel Aspect is fixed flat against stud framing and can be face fixed using a nail gun or fixings can be concealed by hand nailing. Boards are 4.2m long for maximum coverage and factory sealed to easily accept exterior grade paints. Surround™ responds to the preference for high performance, lightweight materials and the desire for buildings to enhance the environment where we live. From external façades to interior surfaces, Surround™ is a reinterpretation of cladding as we know it. Panels come trimmed and sealed and can be installed in a horizontal or vertical orientation using the Cemintel Commercial Expresswall® fixing system. Colour matched rivets are available to accommodate the differential movement between the building structure and the façade. They also provide a more seamless aesthetic. Only one rivet type is used for both gliding and fixing points, making panel installation uncomplicated. Panels have superior weather resistance and strength compared to other fibre cement panels of similar thickness. Prefinished coating is highly effective in repelling water which significantly reduces the risk of delamination that may occur in freeze/thaw conditions. Each panel has a final sealant coating applied that will better withstand weathering over time, as well as environmental factors like pollution and microclimatic conditions, such as mould/algae.